2. Add mustard seeds, curry leaves and dal. 3. Fry for a minute and add cloves, cinnamon. 4. After 30 seconds, add turmeric powder, onions and salt. 5. Saute for another minute till onions turn translucent. 6. Add coconut and stir to mix well. 7. Add rice to the pan and reduce flame to low. 8. Stir well and transfer to a serving dish. 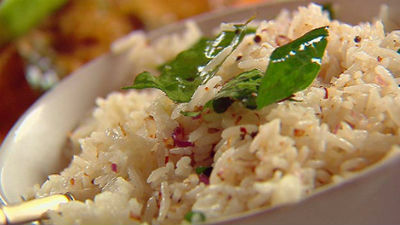 Feel free to comment or share your thoughts on this Masala Coconut Rice Recipe from Awesome Cuisine.